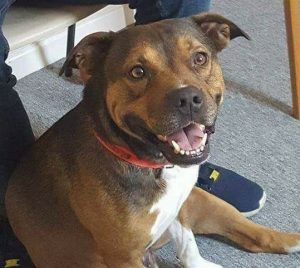 Smiley boy Zeus is a crossbreed of around 7 years. 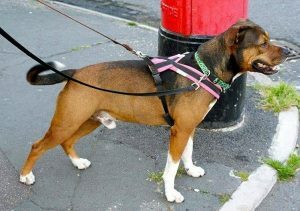 He’s in a foster home in Colchester, Essex through East Anglia Dog Rescue. Cats are a no thank you but he could live with a calm female dog, after happy introductions and children from age 8 as he really loves people! 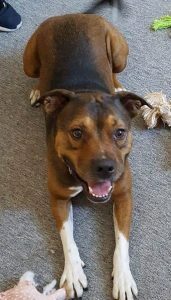 Zeus is a happy, playful boy! He loves his toys and his football is his favourite thing. He enjoys walkies, where he can explore and socialise. At home, Zeus is a joy to have around. He’s clean and well behaved, naturally. He can be left for a few hours but will always be happiest when you’re with him, except if you go in the car. Car rides make him cry, bless him! Anywhere else though, he’s a wonderfully engaging and cheerful companion. Please say you saw Zeus on the Oldies Club website.